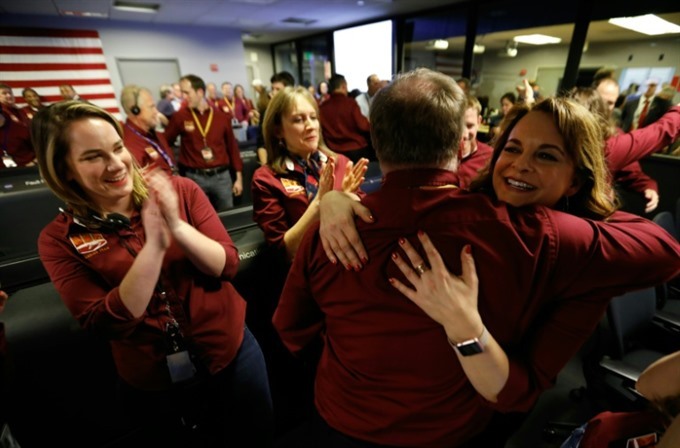 PASADENA — Cheers and applause erupted at NASA’s Jet Propulsion Laboratory on Monday as a waist-high unmanned lander, called InSight, touched down on Mars, capping a nearly seven-year journey from design to launch to landing. The dramatic arrival of the US$993 million spacecraft - designed to listen for quakes and tremors as a way to unveil the Red Planet’s inner mysteries, how it formed billions of years ago and, by extension, how other rocky planets like Earth took shape - marked the eighth successful landing on Mars in NASA’s history. "Here’s a quick-and-dirty attempt at processing out distortion in the first image from InSight," Emily Lakdawalla, senior editor at the Planetary Society, wrote on Twitter. "I’ve just received confirmation that there are no rocks in front of the lander," he said. The nail-biting entry, descent and landing phase began at 11:47am local time at NASA’s Jet Propulsion Laboratory in Pasadena, California, home to mission control for Mars InSight, and ended one second before 1953 GMT. A carefully orchestrated sequence - already fully preprogrammed on board the spacecraft - unfolded over the following several minutes, coined "six and a half minutes of terror." Speeding faster than a bullet at 19,800km an hour, the heat-shielded spacecraft encountered scorching friction as it entered the Mars atmosphere.